Comm Eye Health Vol. 30 No. 100 2018 pp 96-98. Published online 07 February 2018. E-learning Director: International Centre for Eye Health, London School of Hygiene and Tropical Medicine, London, UK. E-communications manager: International Centre for Eye Health, London School of Hygiene and Tropical Medicine, London, UK. Research fellow: International Centre for Eye Health, London School of Hygiene and Tropical Medicine, London, UK. Remaining relevant and keeping up with medical advances is a challenge, as access to high-quality education is inequitable and costly. The open education approach is designed to reduce restrictions to learning. Over the years, improvements in medical education have been linked with improved clinical practice, which has in turn contributed to a doubling of life span in the 20th century.1 However, we are still faced with inequities in health provision within and between countries. Health systems worldwide continue to place growing demands on health professionals to keep up with medical advances, manage challenges due to rapid demographic change and remain prepared to face new infections or environmental risks. Improving teamwork across professional groups, such as ophthalmologists and optometrists. Maintaining high standards for the quality of education in eye health is essential; these should be consistent from country to country. In theory, quality requirements for education in eye health can be aligned by creating international training curricula, practice guidelines and standardised competencies. in practice, however, it is difficult to standardise training due to cost, inequitable opportunities, a shortage of educators and limited access to updated resources. Inequities in education and training can result in low workforce motivation, low clinical and surgical outputs, poor quality of care and dissatisfied patients. In order to address this, medical education needs to keep pace not only with advancements in medicine but also with new educational methods and technologies. Continuing professional development requires that individuals adopt a purposeful, self-directed approach to find resources that are appropriate to them at that time. E-learning, together with guidance from professional societies, can support eye health workers and professionals to do so. Open education is about broadening access to learning by removing barriers such as cost and distance. It is usually done by offering access to free open educational resources via the internet. Learning can be guided or self-directed. The term ‘open educational resources’ first came into use in 2002, when participants at a UNESCO conference defined it as: “The open provision of educational resources, enabled by information and communication technologies, for consultation, use and adaptation by a community of users for non-commercial purposes.”3 Not only can users of open educational resources use or read it, but they can also adapt it, build on it and reuse it. Redistribute. The right to share copies of the original content, your revisions and/or your remixes. The two most important aspects of openness have to do with free availability over the internet and as few restrictions as possible on the use of the resource. There should be no technical barriers (undisclosed source code), no price barriers (subscriptions, licensing fees, pay-perview fees) and as few legal permission barriers as possible (copyright and licensing restrictions) for the end-user. 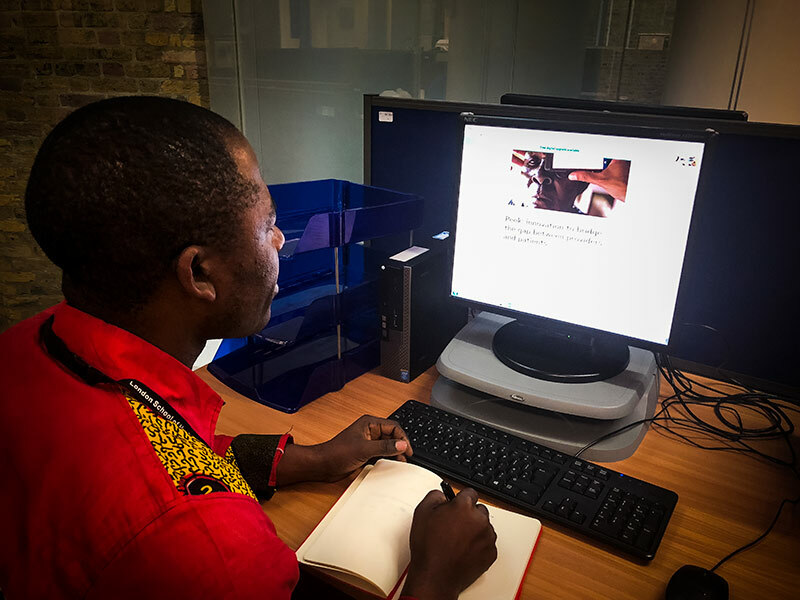 In 2015, the International Centre for Eye Health (ICEH) started to develop open education courses in eye health, with the idea of exploring fresh opportunities in technology and addressing imbalances in opportunities for eye health education. Each course was facilitated over several weeks and learners were able to participate actively in the online discussions. 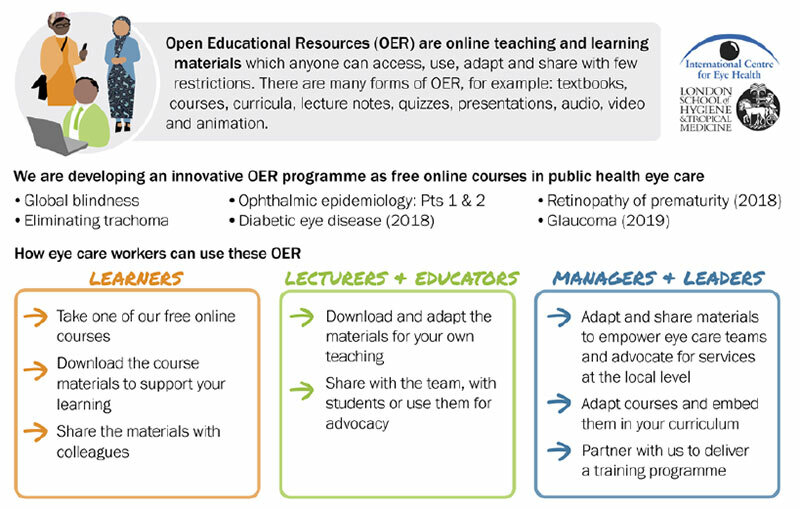 All of the course content was then made available as a range of open educational resources for online use, including videos, images and online articles. The course structure allowed us to align all these resources into a learning framework (curriculum) with clearly structured learning outcomes and self-assessment tests. These became free-to-access, standalone courses on online learning platforms such as FutureLearn or Moodle. The purpose behind this approach is to enable individuals to engage easily with the content, download and reuse it locally; and to adapt and introduce it into their own training programmes. When courses are ‘live’ (facilitated), there are peer discussion forums, webinars with experts who answer learners’ questions, and course mentors who guide a learner through the content. This helps to enhance learning and reflects how people share information in a conversational style, as adopted across many social media technologies such Facebook, WhatsApp or Twitter. Finally, when a user completes the course requirements, they have the option to purchase a certificate as an acknowledgement of their achievement. 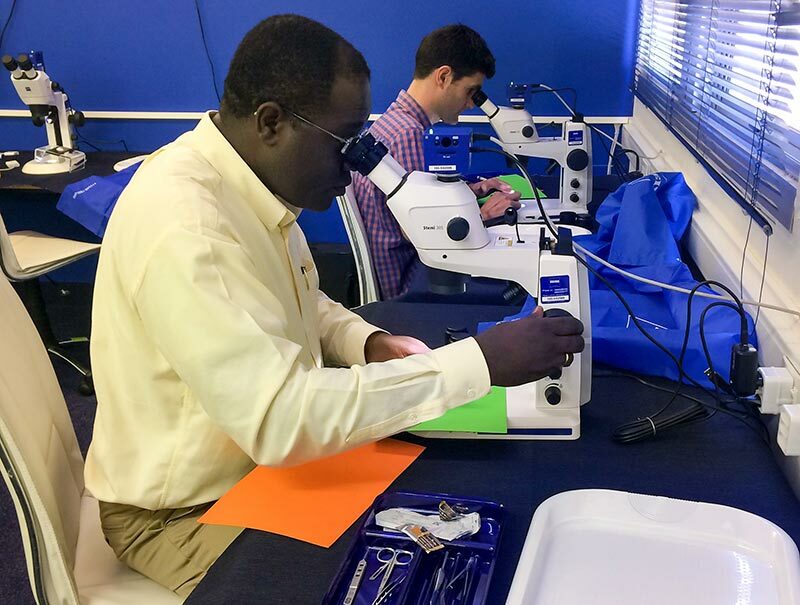 Global blindness: planning and managing eyecare services. This course is structured to help the learner to understand the WHO classification of visual impairment, the magnitude and causes of blindness and the strategies and planning required to control cataract blindness and refractive errors. There are tools to support learners to begin to apply their learning at a local level. Eliminating Trachoma: Trachoma remains endemic and a risk of blindness in 42 countries. This course is a practical induction into SAFE activities that need to be implemented towards the goal of eliminating trachoma. Open education promotes a sense of shared responsibility to ensure that good quality information, of relevance for practice at a local level as well as at the global level, is available. Strengthening an interconnected approach in the digital age has the potential to address inequity in eye health knowledge and encourage the practice of life-long learning for all health professionals. Will Dean, Clinical Research Fellow, London School of Hygiene & Tropical Medicine, London, UK. Over the last 30 years, there have been significant changes in the way eye surgery is taught to trainee surgeons. A fairly recent development is that, instead of learning eye surgery in a live operating theatre, surgeons can practise surgical techniques by simulation: using another object with properties that are similar enough to those of a real human eye. The idea is to help eye surgeons to learn a new technique, such as cataract or glaucoma surgery, safely and effectively. Surgeons are expected to achieve a specified level of competence and confidence before they carry out supervised surgery on real patients. Cataract training by simulation can be done using high-tech computerised simulators, for example the HelpMeSee simulator for small-incision cataract surgery (New York, USA), or the Eyesi Surgical Training simulator for phacoemulsification (VRmagic, Mannheim, Germany). However, these may be unaffordable in low- and middle-income countries. Fortunately, low-cost simulation models are also available. For example, a tomato placed into boiled water for 30 seconds can be used to practise capsulotomy, an apple can be used to simulate scleral tunnelling and a banana or piece of foam is very good for practising suturing. The simulation does not need to be ‘high-tech’ or expensive, but it does need to have high fidelity – i.e., it should be very similar to the real thing. The website www.simulatedocularsurgery.com has a simulation gallery with interesting ideas from around the world. Simulation can be a powerful tool that allows sustained, deliberate practising of individual surgical steps again, and again, and again. Imagine the benefits of being able to practise a scleral tunnel incision or a capsulotomy 50 to 100 hundred times before operating (under supervision) on a patient. Simulation can help trainee surgeons to practise managing complications during surgery and experienced surgeons to learn new techniques. Practice makes perfect, but the correct technique must be practised. Simulation training must be integrated into a curriculum. Trained surgical instructors must be present to offer instruction, guidance and feedback. Outcome measurements and assessments will help to ensure the quality of the training. Although it takes years of experience and practice in the operating theatre to become an expert cataract surgeon, learning cataract surgery to an acceptable level of competence can be achieved safely and efficiently thanks to cataract training by simulation. 1 Frenk J, Chen L, Bhutta ZA, Cohen J, Crisp N, Evans T, et al. Health professionals for a new century: Transforming education to strengthen health systems in an interdependent world. Lancet. 2010;376(9756):1923–58.